Want tosave 0,25 kn on this order and become Loyalty program member? 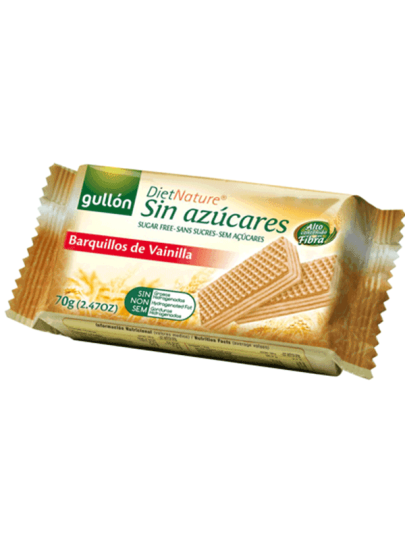 Gullon Vanilla Biscuit is an ideal treat for people with diabetes. Non-sugary foods are also suitable for people on diets and for those who want to reduce the intake of sugar and unhealthy desserts to replace the healthy ones. Gullon cookies do not contain sugar and are the ideal snack for people with diabetes. Appropriate with your favorite tea or coffee is a treat for everyone who wants a healthy diet without sugar intake and people on diets. integral flour (41.5%: integral wheat flour, rolled oats, whole barley flour, whole rye flour), cream [28%: sweetener: maltitol, odmasćivani yogurt powder (18.5%), vegetable fat (palm and the palm kernels), wheat starch, high oleic sunflower oil, dehydrated milk powder, emulsifier: soy lecithin, lactic acid, yogurt flavor (0.3%)], sweetener (maltitol), high oleic sunflower oil, vegetable fibers, expanded rice (3%: rice flour, wheat flour, salt), dehydrated milk powder, volumetric: ammonium and sodium bicarbonate, emulsifier: soy lecithin, flavorings, salt. The product contains gluten, soy, milk. May contain nuts trace.